Vernitta Easton decided to pursue a career in teaching after working a shift job that wasn’t fulfilling. 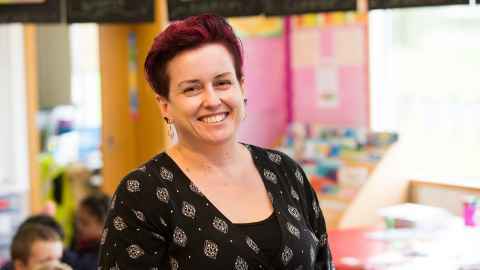 Vernitta Easton completed the Bachelor of Education (Teaching) Primary specialisation, Bachelor of Education (Honours) and Master of Education before becoming a teacher. “Before I studied teaching I was working a shift job that was not fulfilling. I wanted to study to get a decent career. I was also working as a teacher aide at the time and the teacher I was working with encouraged me to become a teacher. I chose to study with the University of Auckland as it has the best reputation and it offered me the chance to study closer to my home. “It also fit into my schedule of being a mum and caring for a school aged child. It was very flexible. The Manukau campus has a unique atmosphere, it is friendly and more like a family than you would think, you are known as a person not just a student. I was able to make friends and have valuable one on one time with lecturers. The support we were given was overwhelming and the lecturers were very approachable. “While I was studying I applied for and won a summer study scholarship which enabled me to help Professor Christine Rubie-Davies with her research. This allowed me to meet prominent lecturers in the gifted and talented field. The opportunity also motivated me to go for my Master of Education. “My supervisors in my honours and masters were the best in their field and the support they gave me was appreciated beyond words. Without them I would never have finished. I am currently working at Willowbank School. This is my second year and I am teaching Year 3 students.